Aloe castanea (Aloaceae) (Cat's Tail Aloe). It usually forms a small tree with a single main trunk at ground level with several spreading branches higher up. Leaves are fairly long with the older leaves persisting along the trunk providing a "skirt". Margins of the leaf are armed with firm, small, brown teeth. 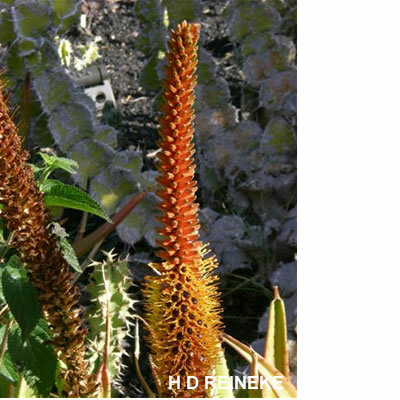 The blooms are an unusual color of dark orange-brown and are formed along the curled and snake-like inflorescence, hence the common name Cat's Tail Aloe. It blooms in winter. 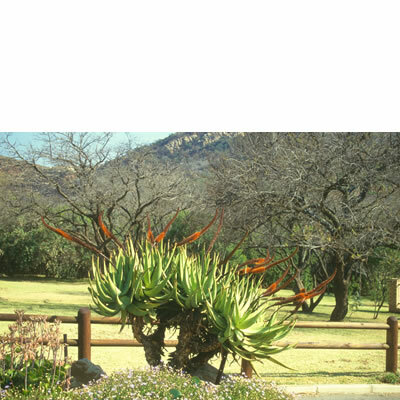 This Aloe is drought tolerant but will bloom better if planted in rich soil and given some water in the summer. Sowing : The seeds germinate very well but may damp off if overwatered. Use a mixture of river sand, compost and soil to sow seeds in. Sprinkle the seeds evenly on the surface and cover with a layer of small pebbles. The pebbles help the seedlings to stay upright and prevent damping off. Keep seed tray in a dry warm corner and do not allow to dry out. Transplant the seedlings after one year. Locality : Ex Hort. Date of harvest : October 2018.